Basics of Engineering Turbulence introduces flow turbulence to engineers and engineering students who have a fluid dynamics background, but do not have advanced knowledge on the subject. It covers the basic characteristics of flow turbulence in terms of its many scales. The author uses a pedagogical approach to help readers better understand the fundamentals of turbulence scales, especially how they are derived through the order of magnitude analysis. This book is intended for those who have an interest in flowing fluids. It provides some background, though of limited scope, on everyday flow turbulence, especially in engineering applications. 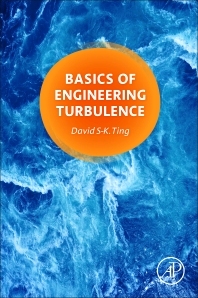 The book begins with the ‘basics’ of turbulence which is necessary for any reader being introduced to the subject, followed by several examples of turbulence in engineering applications. This overall approach gives readers all they need to grasp both the fundamentals of turbulence and its applications in practical instances. Dr. Ting has tangled with engineering flow turbulence for 25 years, starting with turbulent flame propagation in his graduate years, followed by grid turbulence, turbulent heat convection, turbulent flow induced vibrations, and turbulence and wind energy. He has taught a graduate course on turbulent flow seven times. He has also co-authored over 55 papers on turbulence and since 2012 has been on the editorial board for the Elsevier journal, Sustainable Energy Technologies and Assessments.